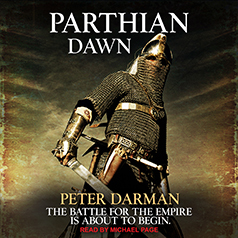 Parthian Dawn is the second volume of the adventures of Pacorus the Parthian and his companions—the fierce and proud Gallia, the ex-Roman centurion Domitus, the scout Byrd and the sorceress Dobbai—as they battle for their lives against the backdrop of the clash between the ancient world's two greatest empires. After three years fighting by the side of Spartacus, Pacorus and his followers have escaped from Italy in the aftermath of the defeat of the slave rebellion. Made a king by the ruler of the Parthian Empire on his return, he has married his beloved Gallia and made the city of Dura Europos on the banks of the Euphrates his home. But his new kingdom is seething with discontent and surrounded by hostile desert nomads who are the sworn enemies of the Parthians. The aged King of Kings, the man who has united the Parthians for decades, then dies to cast a shadow of uncertainty over the empire, which erupts into full-scale civil war as one of the empire's most powerful men, Narses, attempts to seize the high crown by force. Pacorus is forced to fight both Narses and his scheming ally, Prince Mithridates, to preserve the realm and his own crown. And then the Romans, taking advantage of Parthia's internal troubles, launch their own invasion of the empire.